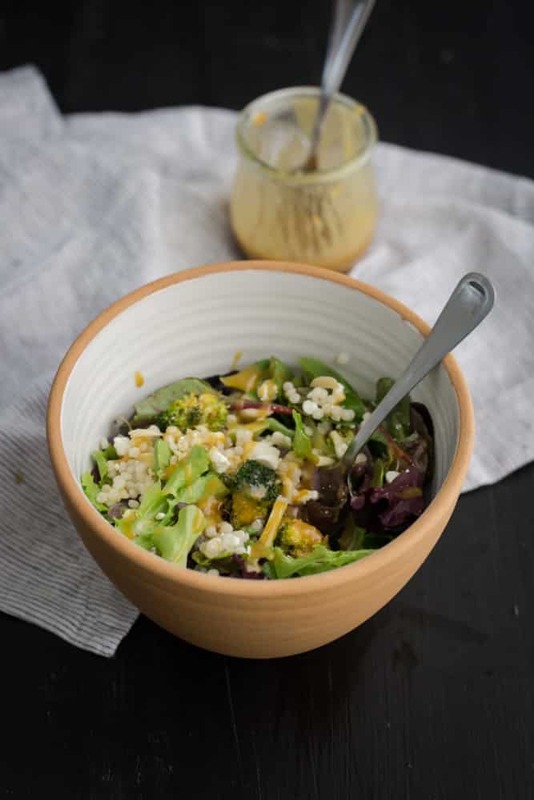 Broccoli Salad with Tahini Dressing | Naturally. It’s always strange when I look back through the archives of the site and realize some key ingredients are lacking companion recipes. I’ve got sweet potatoes and tomatoes covered but upon closer inspection, broccoli is severely lacking. At first I was highly confused as I’m an avid broccoli eater but I soon realized the lack of broccoli recipes could be explained. I just love it roasted and it never makes it into a recipe. This broccoli salad is an attempt at rectifying the problem. Preheat oven to 400˚. 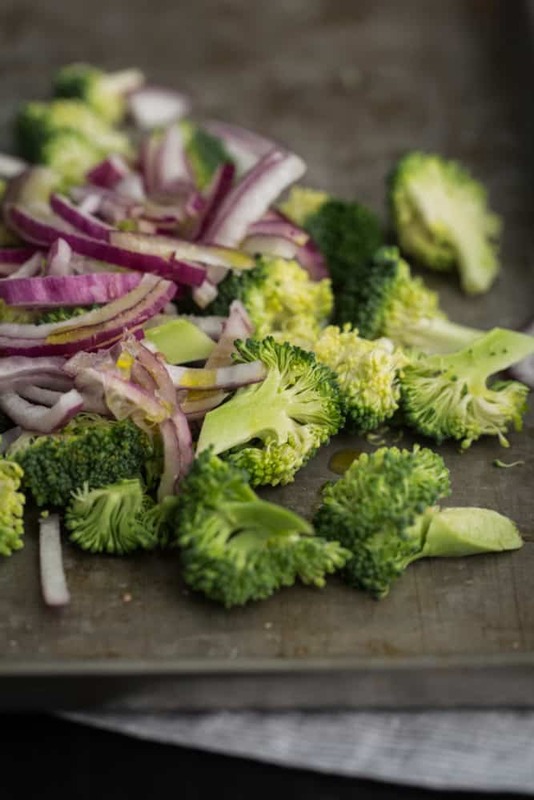 Cut broccoli into bite-sized florets and chop the onion into thin strips. Toss both with olive oil, salt, and pepper. 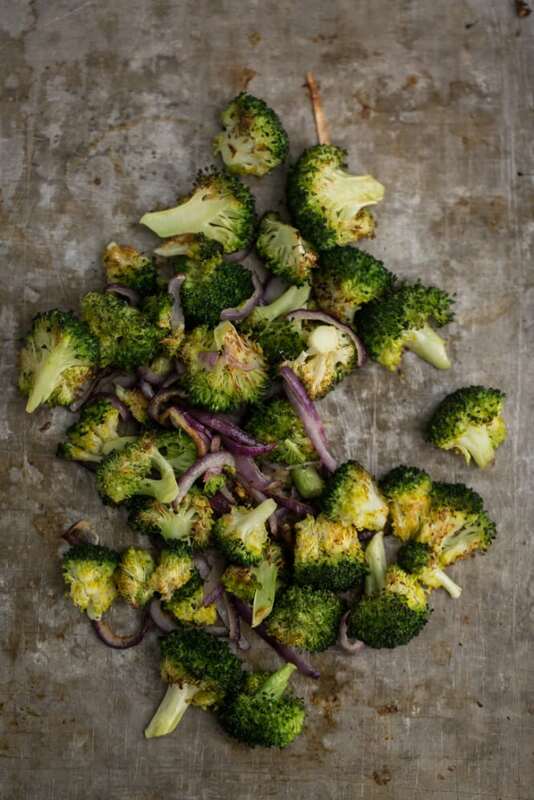 Spread onto a sheet tray and roast for 20 to 30 minutes, until broccoli is tender and lightly charring. 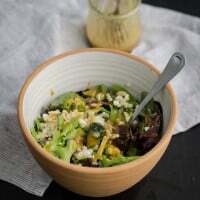 Once the broccoli is cooked, tossed together with the lettuce, couscous, almond slivers, and feta. In a small jar, add the ingredients for the dressing. Shake well and pour 1 to 2 tablespoons over the salad. Toss and serve. broccoli is one of my favorite veggies. I could eat it every night! I’m loving this recipe and can’t wait to give it a try. Yum! Tahini dressing and roasted broccoli seems like an outstanding combination! I can’t wait to give this a try! 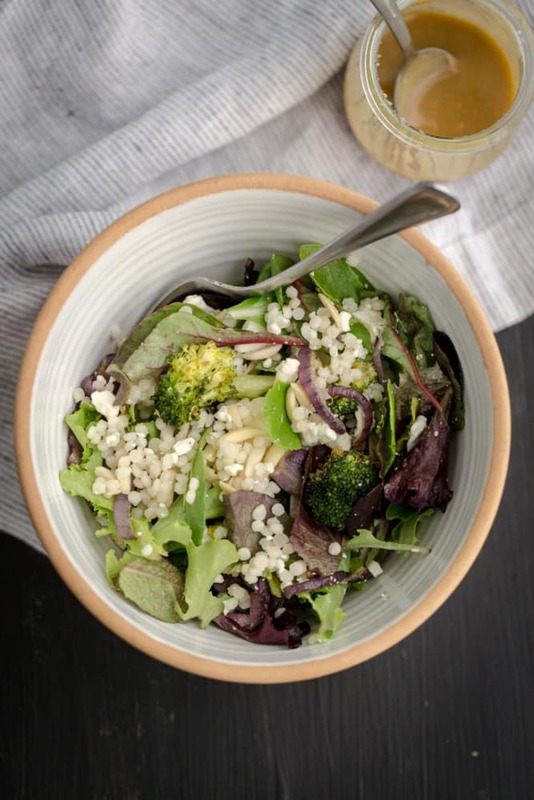 Roasted broccoli is one of my favorites as well, and I especially love it paired with a grain or pasta, so this salad is a keeper for me. This sounds delicious. I’ve not tried roasting broccoli before, but I do Brussels sprouts that way all the time, and cauliflower. This could be good also with a grain such as farro or kamut. I really like the simplicity of the recipe. 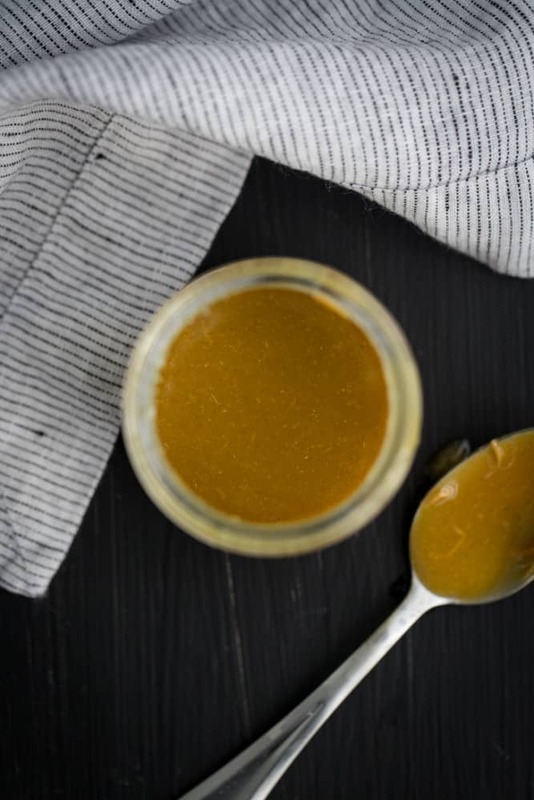 I have half a jar of tahini waiting patiently in the pantry from a humous experiment so this recipe has come at the perfect time! Can’t wait to give it a shot, thank you. Roasted vegetables are the best! Although I have to say that I very frequently just saute broccoli with garlic and red pepper flake too. 🙂 This salad sounds so delicious and easy, Love it! My compliments, you always make food look so good! It must be a miracle that I actually have all of the ingredients in my kitchen right now to make this! Now, I know what’s on the menu for dinner tonight! Thanks for the inspiration!! I just discovered your blog and this is the first thing I have made. It was so good I ate way too much! The only thing I did different was use pine nuts instead of almonds because i happened to have them. Thanks for the great recipe! Will definitely make this again. Wow, the best way to eat brocolli…EVER!!!!! Terrific recipe with a very interesting combination of flavours. I did have to stir the sauce, though: perhaps your Tahini is thinner than mine?